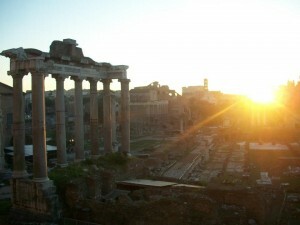 My dearest Roma, you passionate but stubborn lover. The last four months have been an emotional rollercoaster, but so are all the best relationships. When we met in August you seemed decadent, bold, moving, and overwhelming, but I’ve come to learn that there is more to you than that. From learning your history, and discovering that there is so much more to you outside the Colosseum walls, I’ve fallen in love with every hidden ruin. You taught me what real food tastes like, and I love that I can blame you for any extra kilos I’m now carrying around. I knew from the moment I first tried your suppli that we were a match made in heaven. You taught me about art, history, people, and il dolce far niente. The more I got to know you the more in love with you I fell. Like all relationships, however, it wasn’t always butterflies and rainbows. There were times, usually when I was waiting 45 minutes in the rain for a bus to come, when I thought we should end this. There were times when I thought that I could live without you. When I was writing a paper at 2am and couldn’t order food, or when I sat down to Mensa and thought, Really? Eggplant AGAIN? Your inability to drive and park a car drives me crazy, and I often found myself wondering how you get anything done with your inefficient attitude. There were moments of struggle, for sure, but I believe that those struggles only made us stronger. And every time, without fail, when I began to question your love, your beauty, you always found a way to prove it to me. I would suddenly find myself watching the sunrise over the Forum, or standing in the middle of the Sistine Chapel, overwhelmed with this experience. You, Roma, move me and inspire me in ways I never thought possible. And, more importantly, you encourage me to grow and change. You helped me become a stronger, independent person and I am a better woman today because I met you. But now comes the time to say goodbye. Although I would never want to leave you I must go. I can’t imagine a life without this city, and don’t know how I’m going to make it without your charming streets, your amazing food, and your passion that livens up even the hardest of hearts. These four months have been the most incredible four months of my life, and I’ll never forget them. Thank you for being the most amazing city I could have ever called home. I’ll miss you everyday, but I’ll take the memories and lessons I’ve learned with me wherever I go, and know that we will be reunited again soon. I threw my coin into the Trevi to prove it. It’s funny how God has our lives come full circle sometimes. Seven years ago, when I was in the eighth grade, my choir came to Rome over Christmas break to sing not only in Rome and Vatican City, but also to take a pilgrimage and sing in Assisi. 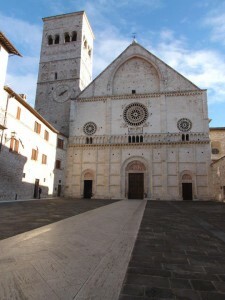 Seven years to the month later I found myself once again in Assisi. The same place where my love for Italy began when I was 13 years old would be my last trip of my semester of a lifetime. In a lot of ways, the trip was overwhelming for me. Not only is it the end of my semester, which is upsetting enough, and not only did I get to spend the day in this incredibly holy town, but I could also picture my younger self in Assisi. I remember climbing down the hill to the bus in the sleet and snow, I remember walking through all these churches in a sea of red choir robes, and I remember how it felt to be on the most exciting trip of my life, as I once again find myself on an incredible journey. It was truly a religious experience. The trip was, in every sense, a pilgrimage. Lead by Father Al (the liveliest priest I’ve ever had the priviledge to know) we began the day visiting the Basilica of St. Francis, built to commemorate him and to house his body. We walked through Piazza del Commune, where St. Francis stripped naked and gave himself over to Christ. 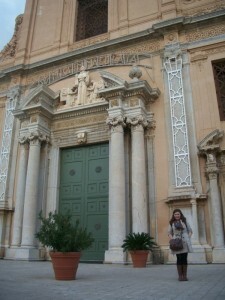 In the same piazza is the home of St. Chiara (Clare). Between St. Francis and St. Chiara the entire town is a shrine to preserving every moment of their lives. We church hopped through the town, seeing relics of the saints and even praying at the cross that spoke to St. Francis (how amazing is it that it’s still in the town!) We saw the rose bushes that St. Francis jumped in to escape Satan, which now no longer grow thorns, and the doves that for years haven’t left a statue of St. Francis, next to the rose garden. It was incredible how with every turn you could feel the Holy Spirit in the presence of this little town. That night we enjoyed a huge, hours long dinner in Orvieto (is there any other way to eat??) 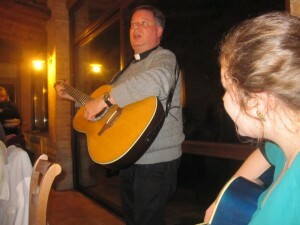 As dessert came out the fun continued, as Father Al and I brought out the guitars and lead the group of 30+ students, faculty, and seminarians in a Christmas sing-a-long, that we continued on the bus on the ride home. I couldn’t have pictures a better trip to wrap up my semester. The day was the epitome of everything I love about this semester: Faith, food, friends, and this incredibly community we call the John Felice Rome Center. Some of you (my most loyal readers) may remember my post from earlier in the semester when I wrote about seeing my family’s villa in Tuscany. I told you a little bit about my family’s heritage, and about our roots in Tuscany. What I didn’t tell you, though, is how that’s only half the story. The Italian half of my family is actually very diverse. My Grandmother’s side hails from Tuscany, while my late Grandfather’s side of the family comes from Sicily. I was lucky enough to receive a Forza Roma Scholarship to travel to Sicily. The Forza Roma Scholarships are awarded to students who present (in the form of an essay) a specific reason for wanting to travel to a certain place, in my case to discover the other side of my Italian roots. Without this scholarship the trip would not have been possible, and I am forever thankful to the committee for granting me the scholarship. We started our trip in Catania. Catania is located right next to Mount Etna, and when you fly in the landscape looks like Tuscany but with a black dusting across it, thanks to the fertile soot from the volcano (but more on that later). Our bed&breakfast was located right off of the main piazza. When we opened the door to our room we were greeted with a great surprise; instead of just a room we had a mini apartment, including a kitchen! We were thrilled with the change to cook after being kitchen-less for the whole semester and immediately ran off to the market to start planning dinner. The market was huge, and was lined up and down all these tiny blocks by our B&B. 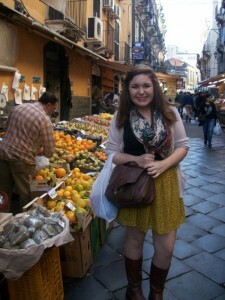 The market had everything from vegetables I had never heard of to the freshest (still alive!) fish. We stocked up on veggies, pasta, meat, spices, bread, and cheese before dropping them off and heading out to explore the city. Catania is absolutely beautiful. 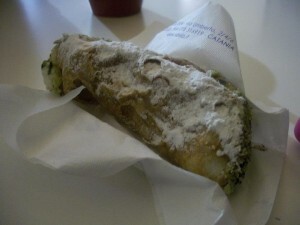 We went to Savia, this famous bakery, to try their cannoli and arancini and they were AMAZING. Well worth the wait and long walk over. 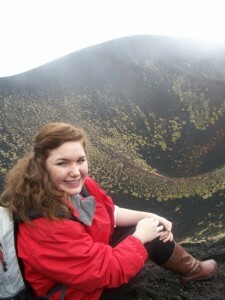 The next day we took the most amazing tour of Mount Etna, the active volcano next to Catania. We were picked up in the morning and the three of us and four other tourists were taken up the volcano while our guide explained the history of the volcano, the eruptions, and how it has positively and negatively affected the land. The volcano was so beautiful, and as soon as we started heading up we entered into a cloud. It was so beautiful and surreal. We kept saying we felt like we were on the moon! After climbing to the top our guide drove us down a bit to where we could enter into a lava cave. Our guide gave us hard hats and flashlights and lead us into this pitch black cave, where explained how a lava flow is created. He even pointed out how you could see the roots from the plants above us growing through the ceiling! After the lava tube we had a lunch of sandwiches and wine followed by a honey, wine, and olive oil food tasting. The entire day was absolutely fabulous, and one of my favorite adventures while studying abroad. The next day we took the trip that I had been waiting for since receiving the Forza Roma Scholarship: we went to Termini Immerse, the town where my family is from. 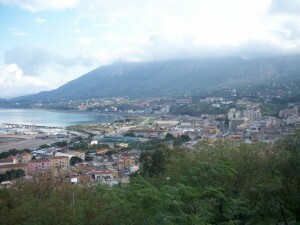 The town is about 30 minutes outside of Palermo and is mainly a fishing town. I could tell that Termini was going to be a charming town as soon as we arrived. I was able to visit a few of the churches and their Duomo (I swear, EVERY TOWN in Italy has a Duomo!) along with their stunning scenic overlook. Everyone we met was so nice and so excited to hear that my family was from the town. Although I didn’t meet any of the 62 Mantias that still live in Termini I was still able to get a sense of the town and feel what it must have been like to live there so many years ago. 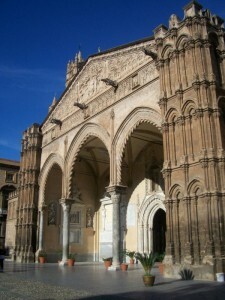 From Termini we then went to Palermo, the main city of Sicily. Although we were there for just about 12 hours we still got to see most of the famous touristy sites, including their incredible Cathedral and theater, made famous by the Godfather III. Although my visit to Palermo was fleeting I was able to see all the beauty it had to offer. From climbing an active volcano, to seeing the town where “Mantia” is from, my trip to Sicily was definitely one of those trips that I will carry with me forever.